Intego Mac Premium Bundle X9 Review – An Ultra-Powerful Software Suite That Takes Full Care of Your Mac! If you believe that your Mac is immune to malware, you’re dead wrong. With numerous marketing messages highlighting MacOS’ features back in the 1990s and 2000s, many still believe that antivirus software isn’t something that they should deal with. To prove those users wrong, we don’t have to look too deep in the past. Recently, VeryMal infected numerous Mac computers, CoinTicker installed backdoors on MacOS, and even spyware was detected in the MacOS App Store. And this is just a small group of news about what’s happening in the world of digital security right now. As a way to put an end to all your worries, many companies have come up with their own digital solutions. And one of those companies is Intego, known for their range of security tools for Apple products. Being on the market since 1997, they know a thing or two about security. And in this article, we’ll be looking at their flagship software – Mac Premium Bundle X9. To get started, we’ll introduce you to this set of applications. Take a close look at the following table to learn the basic information about Intego’s Mac Premium Bundle X9. Real-time protection and on-demand scanning. Capable of detecting 100% of malware. Proactive antivirus protection; Network-related protection; Cleans and removes junk files; Parental controls; Backup solution. 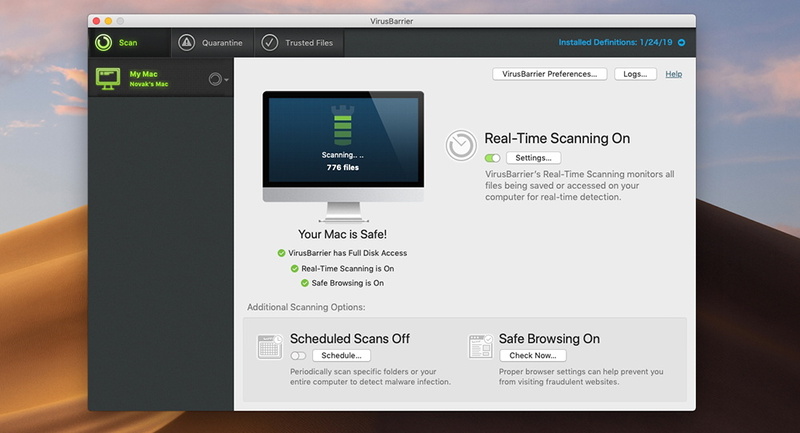 VirusBarrier X9, NetBarrier X9, Mac Washing Machine X9, ContentCarrier X9, Personal Backup 10.9. We do highly recommend reading this entire article. However, we understand that some of you might be in a rush. This is why we’ve included a second table, found below, with our findings after testing and reviewing Intego’s software. Highly comprehensive software suite; All-in-one solution; Capable antivirus; Lots of fine-tuning available; Impeccable customer support. Can slow down your Mac a bit; Easy to use, hard to master. Intego’s Mac Premium Bundle X9 is an ultra-powerful solution to keeping your Mac secure and have it running at its best. We’re now ready to dive deep into discovering everything that Mac Premium Bundle X9 has on offer. So, if you want to truly get to know this software, keep on reading. In this article, we are going to focus on Intego’s flagship antivirus solution, called VirusBarrier (version 10.9.17). However, we will also explain everything you need to know about other products within the Mac Premium Bundle X9 that make your Mac run faster than ever before. There’s plenty to talk about, so let’s jump right in. 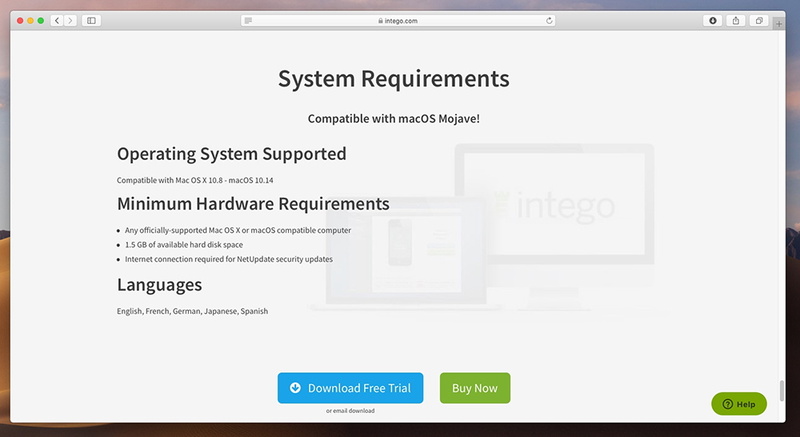 Intego’s Mac Premium Bundle X9 is compatible with a broad range of Mac computers and MacOS versions, including MacOS Mojave as well. Our Score: 10/10. Intego is a company dedicated to producing software solution for Apple products. Therefore, the company’s Mac Premium Bundle X9 is compatible with MacOS. However, you don’t need to have the latest MacOS version installed since this suite of application is compatible with OS X 10.8 and up. It’s nice to see that Intego is thinking about users of older hardware, who now have a reliable way to protect their Mac, resolve certain technical problems, and make sure their computers run in the best way possible. 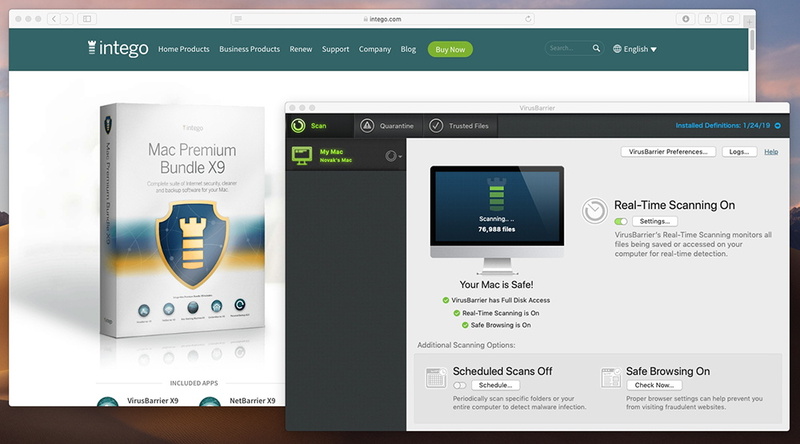 Intego is offering a very simple and convenient way to install the Mac Premium Bundle X9. You can get started within minutes of your time. Our Score: 10/10. Getting started with Intego’s suite of applications begins by visiting its official website. This is where you can buy the software first, and then proceed to download it. However, Intego is also offering a free trial with no restrictions in terms of features. The installation file comes as the DMG file format and it’s around 115MB in size. Open the downloaded file, and then run the installer. Once installed, you’ll be asked to restart your Mac. Then, you will need to grant permissions to VirusBarrier via System Preferences. There’s a really nicely designed guide with images that will help you finish this procedure. The first time you open any of the applications included in the Mac Premium Bundle X9, you’ll see a Welcome Screen letting you know about what to expect. 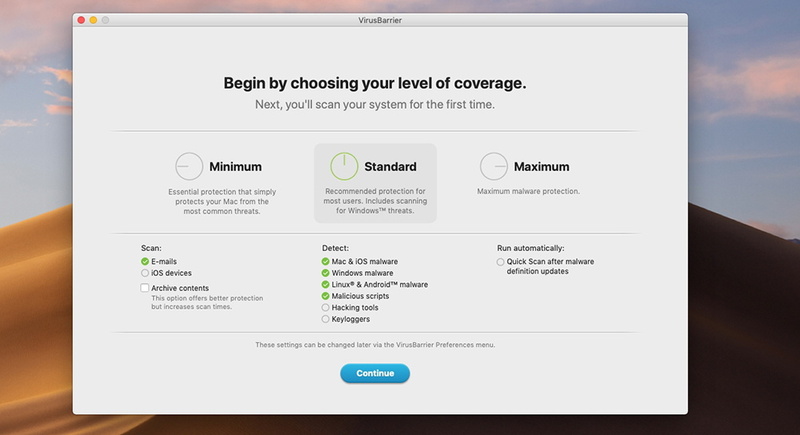 Some applications will also ask you to set up custom preferences, like VirusBarrier for example. This is where you can choose from three levels of security: Minimum, Standard, and Maximum. All in all, Intego has done a marvelous job of making the installation process as simple as possible. Even if you’re a complete beginner, you’ll see helpful guides explaining what needs to be done. More experienced users will need only a few minutes to set everything up. Intego’s Premium Bundle X9 brings a unified UI design across all of its apps. However, some of those bring a more up-to-date design than the rest. Our Score: 8/10. What’s nice is that Intego is using the same design language across all those apps. They look, feel, and work similar to each other. Giving you an in-depth look at each application would take plenty of time, so instead, we’ll focus on VirusBarrier, which is perhaps the best example in this suite. However, we’ll also tell you what to expect from other applications as well. Upon launching VirusBarrier, you will see three distinct areas. At the top, there are three self-explanatory options. 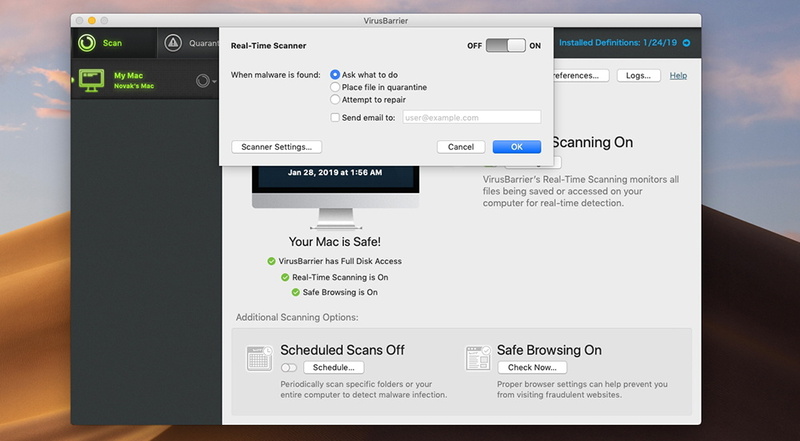 You can click on ‘Scan’ to scan your Mac for malware, while ‘Quarantine’ is where you can inspect potentially dangerous files (where you can trust, delete, or repair them). And the final tab, called ‘Trusted Files’, lets you set up folder exclusions. The main screen is located under the ‘Scan’ tab, which is what you’ll see when you open the application. On the left side, there’s a sidebar which lets you do a quick or full scan. And on the right side, you’ll find plenty of interesting things as well. You can enable/disable real-time scanning, set up scheduled scanning, and even enable/disable safe browsing in your Web browsers. 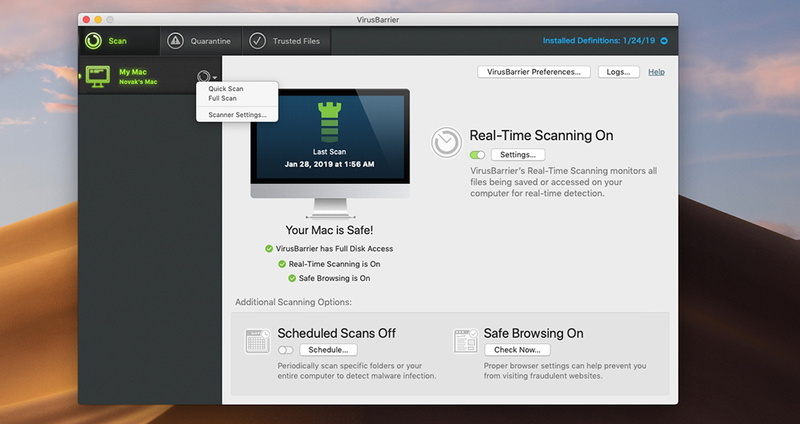 General: VirusBarrier lets you scan your all your Mac’s files. This can include your emails, external disks when connected, as well as your iPhone, iPad, and iPod Touch. You can also decide whether to scan external volumes each time you connect or if you want to do a custom scan after each malware definition update. Scanner: Now, here’s something truly interesting. You can decide which types of malware you can let VirusBarrier detect. This includes Mac, Windows, and Linux malware, malicious scripts, hacking tools, and even keyloggers. You can also choose to scan archives and set priority for this application, which can improve the overall performance of your computer. Advanced: There’s only one option here, which allows you to set the application to ask for admin password if someone tries to make changes to its settings. This application allows you to fine-tune each registered account on your Mac. You can set how each user can behave and you can even review their activity. This means that ContentBarrier might just be the perfect application for parental access. On the left side, you’ll see a list of accounts. Click on any, and you can fine-tune a bunch of options. You can select which websites a specific user can access, set up scheduled access, allow/block chats, set up screen recording, block certain applications, and fine-tune a bunch of other options. ContentBarrier allows you to fine-tune the way your children are using email, downloading files (regular, FTP, and P2P), block SSH access, and even block access to game servers. You can think of this application as a highly capable version of your computer’s firewall. 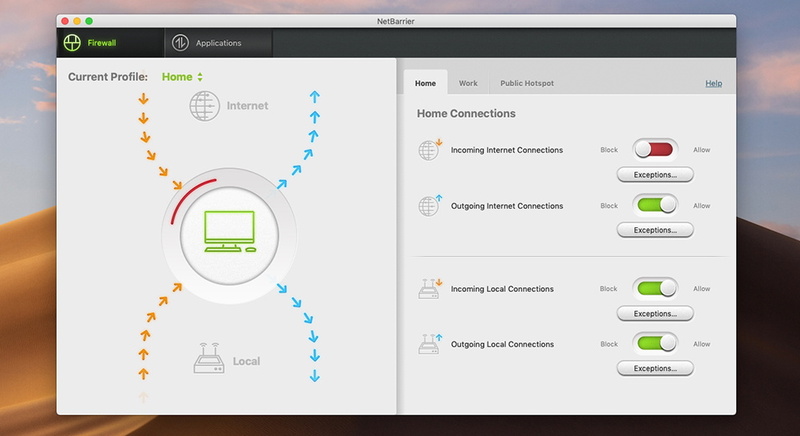 In other words, NetBarrier allows you to set the way your computer manages incoming and outgoing Internet and local connections. You can choose from three predefined models: Home, Work, and Public Hotspot, but you can also fine-tune everything on your own. Aside from setting up your computer’s firewall, you can also check the activities of individual applications by checking their incoming and outgoing data. This allows you to check for any suspicious application or process and get rid of that problem accordingly. This application is designed to identify old, obsolete, and junk files on your Mac. As such, it provides a convenient and fully automated way to remove the cache, downloads, language files, logs, and items in your trash. 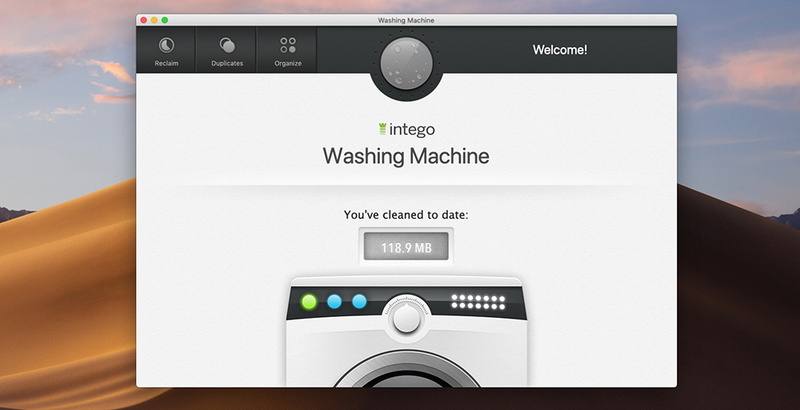 Intego’s Washing Machine also scans for duplicates and organizes files on your desktop, dock, and via smart folders. Finally, Intego’s Mac Premium Bundle X9 also comes with a backup solution. You can easily choose which files and folder you’d like to back up, select the destination of your backup, and pick between daily, weekly, and manual updates. Intego’s Personal Backup also allows you to create bootable backup disks. This means that you can back up your entire hard drive in regular time intervals. And, there’s one more option called ‘Synchronize’, where you can choose different folders and keep then in sync at all times. It’s clear that Intego is trying to simplify their applications and make them easy-to-use. This effort has been successful, for the most part. Our Score: 8/10. 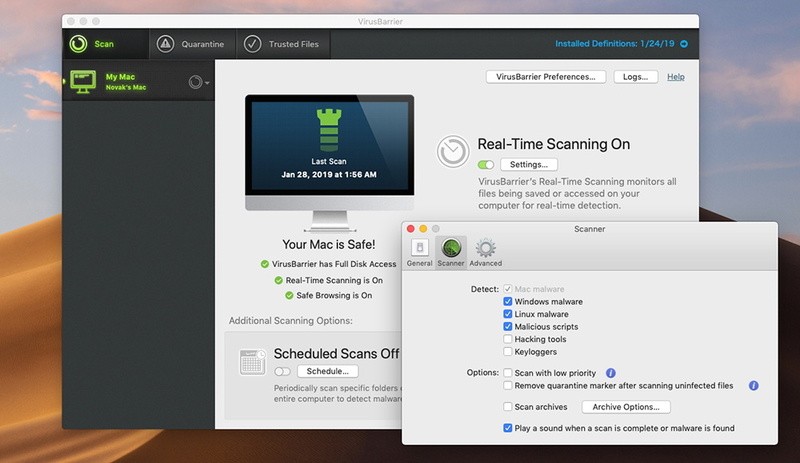 Real-Time Scanning: Intego’s VirusBarrier can actively scan your Mac in the background in real-time and alert you of any suspicious activity. You can enable/disable this feature and even customize it by telling VirusBarrier to quarantine or repair suspicious files. Scheduled Scanning: You can also instruct this application to run scans in certain time intervals. For example, you can run a full or quick scan each day at a certain time. Safe Browsing: Lastly, you can let VirusBarrier pick the best settings for your Web browser that will keep it more secure and prevent you from visiting fraudulent websites. At any moment, you are free to run a quick or full scan, which can be accessed from the left-placed sidebar. And you can always return to this application to decide what to do with potentially dangerous files. You can choose to delete them or repair them, if possible. A similar design principle is present in other apps within Mac Premium Bundle X9. It’s up to you to visit all of them, choose your preferred settings and let them do their job in the background. Some of these applications are more complex than the others, like Personal Backup, for example. However, seeking help on Intego’s website should clear any doubts. When it comes to antivirus protection, you can rely on real-time, manual, and scheduled scans. So, there are plenty of options to keep your Mac secure. Our Score: 10/10. Intego’s VirusBarrier brings two types of antivirus protection: automatic and manual. To see how each of those is working, we’re going to take a deeper look at this application. So, here’s what you can expect. As noted earlier, Intego VirusBarrier offers automatic and real-time protection. As soon as you launch the antivirus, you will see a detailed report on the status of this application. VirusBarrier will you know if it has full disk access (to scan your entire hard drive), and whether real-time protection and safe browsing are enabled. If you’d like to take a closer look at how automatic protection is working, you can click on ‘Settings’, on the right side of the window. This is where you can enable/disable real-time protection. And there are three options to pick about what happens when malware if found. You can decide later by letting VirusBarrier ask you in each instance, or you can let the application quarantine or repair the problematic file. And, there’s also a handy feature that notifies you via your email address. For additional options, you can click on ‘Virus Scanner’ where you can choose which types of malware can be identified. 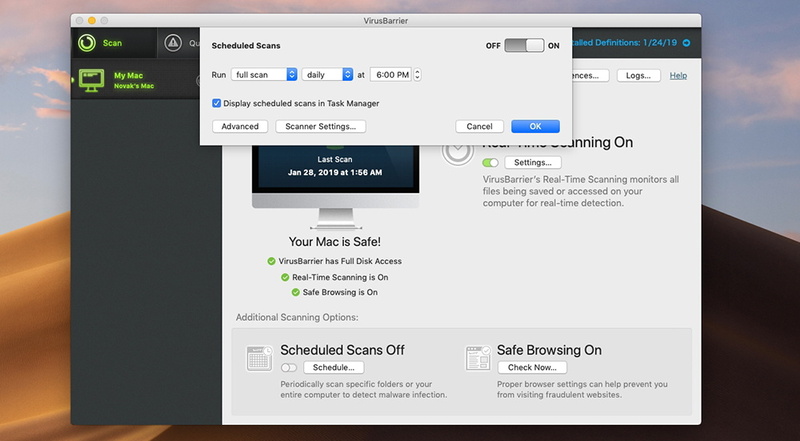 Quick Scan: This type of scan searches for malware in the most common places on your Mac, and as such, it can be a good way to remove common types of malware. A quick scan usually takes only a few minutes of your time. Full Scan: VirusBarrier can also do a full (deep) scan. This type of scan takes more time to complete. However, it dives deep into your system, which means that you should use this option at least once a month. It’s also worth mentioning that you can automate manual scans. This is done by scheduling them from the application’s main screen. VirusBarrier provides a set of comprehensive options that let you create different kinds of schedules scans. You can choose to schedule a quick or full scan, choose what needs to be scanned, in which time intervals, and more. This is a very handy feature and we recommend you to try it out. Intego’s VirusBarrier can detect 100% of malware with the industry standard currently being set at 99.6%. This is an amazing result! Our Score: 10/10. Aside from checking different types of scans, you also want to know how successful is VirusBarrier when it comes to catching malware. To find out this information, we turn to AV-Test, which is considered to be the most reliable and independent source of antivirus performance information. Intego’s VirusBarrier is capable of detecting 100% of widespread and prevalent malware. This is a fresh result, with AV-TEST putting VirusBarrier to a test one month ago. The industry average sits at 99.6%, which means that VirusBarrier is truly a capable antivirus solution. When it comes to false detections, VirusBarrier comes with the best possible score of 0%. This means that this application can successfully avoid false detections that could otherwise put your favorite (and safe) apps to a risk. It’s safe to say that Intego’s antivirus can keep you safe at all times, as per AV-Test. Once again, we’d like to note that AV-Test is the industry’s most reliable source of information in terms of antivirus software. With Intego ranking high, you can’t go wrong if you decide to trust this application. Intego’s VirusBarrier will make your Mac slower, especially when it comes to opening and installing applications. Our Score: 5/10. Intego’s Mac Premium Bundle X9 comes with a series of apps that aren’t demanding in terms of computing resources, expect from VirusBarrier. Just like any antivirus, this one can slow down your Mac which is the price you need to pay if you want full protection. 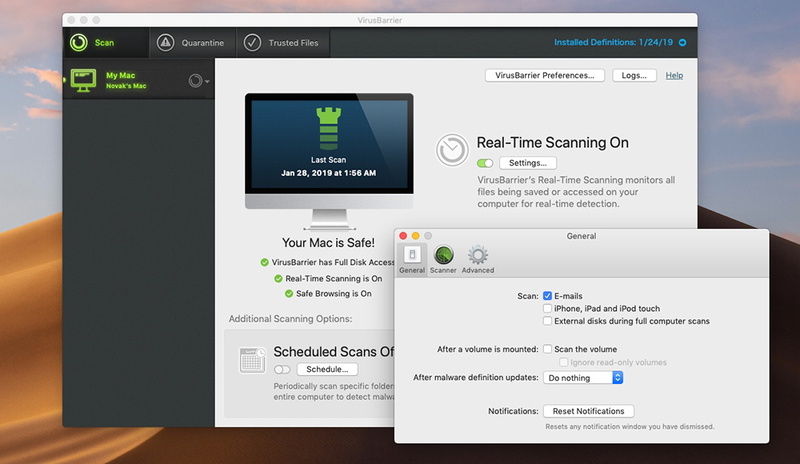 So, how can we measure the impact of VirusBarrier on your Mac? Well, we’re going to turn to AV-Test once more which gives you precise and concrete numbers. So, here’s what you need to know. To install a new application with VirusBarrier’s real-time scanning enabled, it will take 105% more time than usual. This isn’t such a good result as top-rated antivirus solutions minimize this to 29%. And lastly, VirusBarrier will slow down the copying of files by 2%, which is better than the average score of 15%. 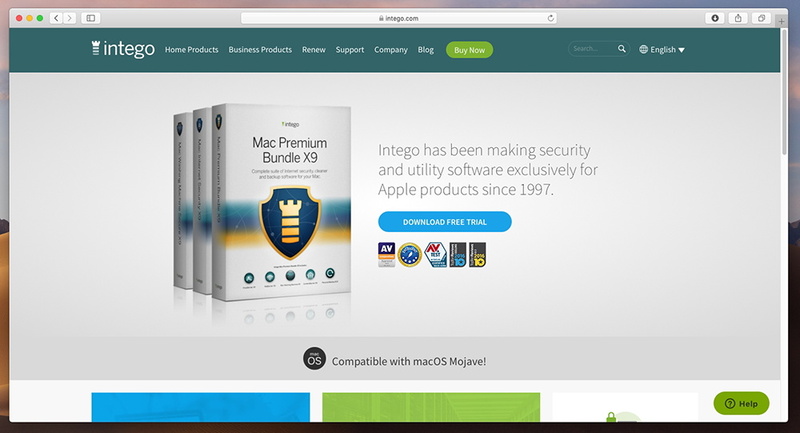 Intego is a reputable company with a long history of offering Mac software. With this said, they provide highly reliable customer support channels. Our Score: 10/10. Intego knows that their users will need help at times. And since this company has been offering software products for a long time now, they’ve developed numerous customer support channels. Knowledge Base: To get started, you can take a look at the company’s knowledge base. This is where you can find all kinds of questions and answers. No matter the question you have, we recommend you to start here. Frequently Asked Questions: The official support center (on the company’s website) comes with a segment containing plenty of frequently asked questions. They are nicely categorized and there’s an option to search manually. Apple Resource Center: Interestingly enough, Intego has a section on their website dedicated to educating Apple users. You can learn about malware, all kinds of myths and misconceptions, how to stay safe online, and plenty more. Support Tickets: Finally, you can also choose to open an official support ticket. 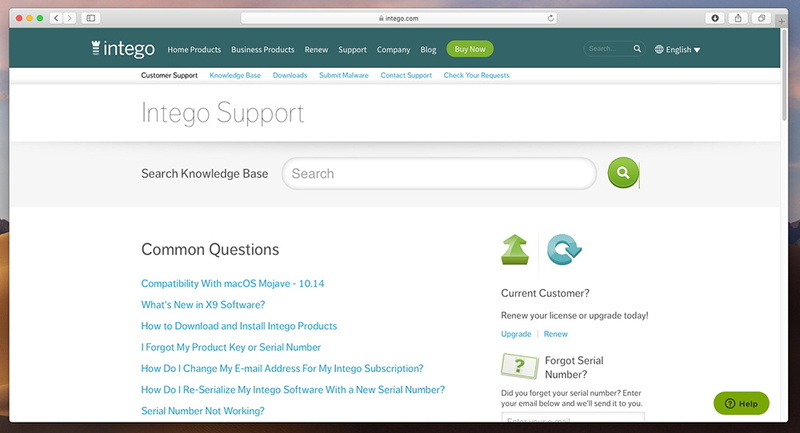 If you can’t find help in any other way, you can send your inquiry to Intego’s tech support. You should be able to receive a response within 48 hours. In practice, a response will come within 24 hours in the majority of situations. Even though it might look expensive at first, you’ll get 5 fully-featured applications with this bundle, which translates to a lot of value. Our Score: 9/10. 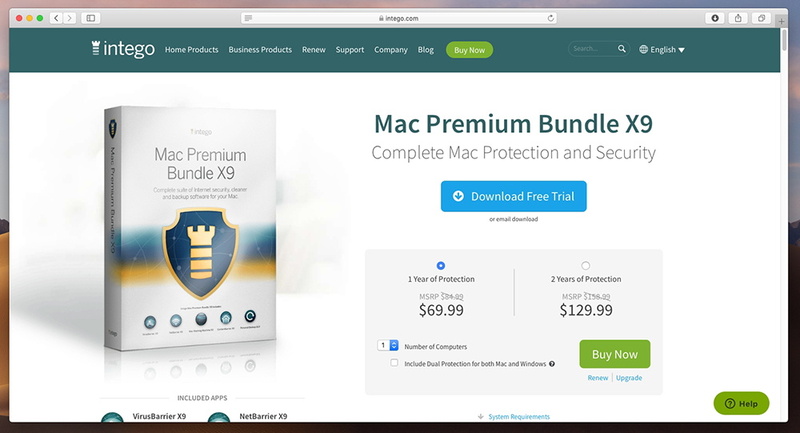 Intego’s Mac Premium Bundle X9 comes as a subscription service, where you can choose between one or two years of protection. There are no monthly plans, and you can’t buy a standalone license that grants you unlimited use of this software suite. You can buy 1-year of protection for $59.99, which grants you access to Mac Premium Bundle X9 with no limitations for 12 months. Or you can buy 2-years of protection for $109.99. There are no differences between these two subscription plans, except in their duration. This might seem like a lot of money – but remember that you’ll get 5 ultra-powerful standalone applications. You can protect your Mac against malware, create regular backups, set up parental controls, clean junk files on your Mac, and plenty more. Therefore, it’s safe to say that there’s plenty of value for the price here. Do We Recommend Mac Premium Bundle X9? The truth is that Intego’s Mac Premium Bundle X9 is the best way to ensure that your Mac is running at its best. Plenty could be said about this amazing software suite, and we warmly recommend it to anyone looking for an all-in-one package. PROS: Incredibly powerful applications; Strong antivirus protection; Automatic and manual protection; Easy to use; Plenty of fine tuning available; Trial version available. CONS: Can slow down your Mac; Takes time to truly master. OUR SCORE: 8.9 out of 10! Dear readers, that would be all we’ve prepared for this review of Mac Premium Bundle X9. In case you’re interested in trying this software suite on your own, please use the provided link. You’ll be taken to the official website where you can find additional information and download your trial version. Finally, we’d like to ask you to share this article online. And don’t forget that you can follow TechNadu on Facebook and Twitter. Thanks! Intego has come up with a highly interesting all-in-one software suite that can protect your Mac against today's Web dangers. With this said, the Mac Premium Bundle X9 can easily become your go-to tool for making sure your Mac is running at its best.